Good food, vegan options and colorful cocktails. If you ask Austin Hartman, heaven is a place with more varieties of rum than the imagination can hold. 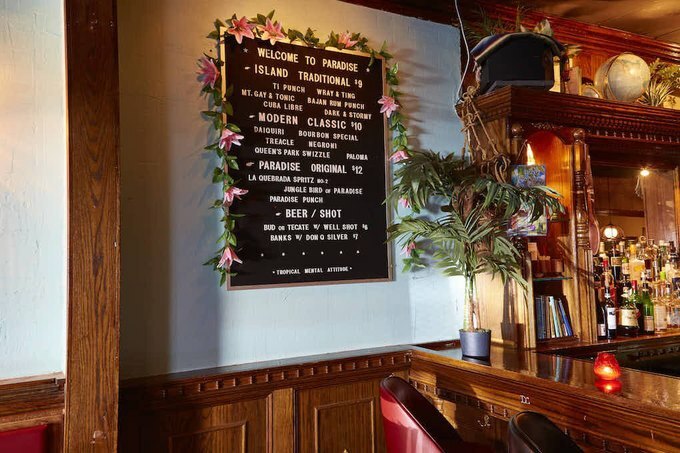 A longtime fan and connoisseur, something acquired during the regular trips he’s taken since his youth to the rum shops of Barbados, Hartman finally had the chance to distill this vision when a small bar on Woodward Avenue in Ridgewood called Paradise closed last year. Bespectacled and with a sailor’s sleeve of tattoos, Hartman ran the bar at the recently shuttered (and reconceived) Montana's Trail House and used that sudden change to blaze his own trail and create his own drink menu or, more aptly, drink program. “It’s really one of the most malleable drinks, ever,” Hartman said. The new design of the place is a colorful idea of Miami in the city’s pre-CSI days, when marinas were bright blue and maps, like the kind that Hartman has decorated the walls of Paradise Lounge with, were vitally necessary to set sail. Hartman points out one of his favorites: Vieques, a small Caribbean island that's part of nearby Puerto Rico. 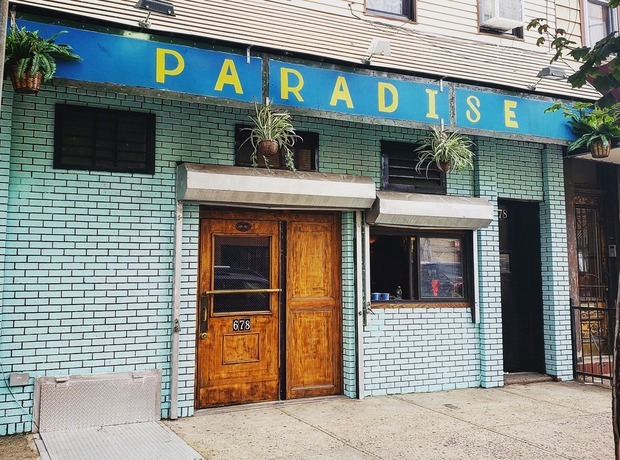 The new kitchen at the Paradise Lounge also doubles as a brick-and-mortar home for Ed & Bevs, a small culinary institution which has been traveling around the city for some time now, spending summers with the beach crowd at Far Rockaway. The back of Paradise Lounge is their most permanent home yet. The move also gave brothers Max and Eli Sussman the chance to debut an all-vegetarian version of Detroit diner fare, offered right alongside standard diner dishes: vegan dogs and soy chicken tenders, vegan Coney fries with vegan cheese sauce, and a vegan cheeseburger that you can order double stacked. Max Sussman says that he isn’t vegan himself but has dabbled in the lifestyle for spells. Developing vegan versions of some of their signature work had been a preoccupation of the Sussman brothers for some time. The Sussmans—whose inspiration for the cuisine comes from the economically battered but creative streets of Detroit—deliver dishes drawn from that cut-up the city’s cultural legacy. From Greek salads to the endless legacy of the Detroit-style Coney dog, covered in a beanless meaty chili. The experiments continue for their brunch menu A hash of hot dog meat and chili topped with an egg takes the place of hollandaise-sauced benedict. The egg sandwich is buttery soft and topped with a house-made cheese and hot sauce and served with a side of crisp breakfast potatoes. 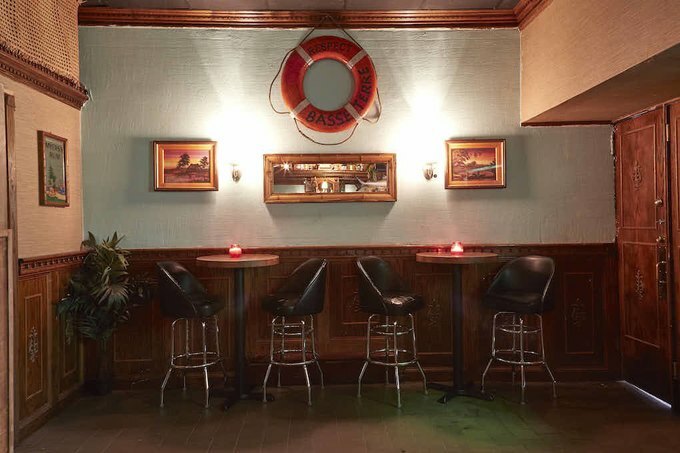 At Samesa in Williamsburg, which was the brother’s first brick-and-mortar culinary endeavor, they made their version of the falafel stand, and under the Ed & Bev name, they turn to the creations of the small diners that blink alongside Midwest highway lights. It’s a not unlikely place to find paradise– and it’s found here alongside reasonably priced cocktails.